Famous Punjabi singer and actor Ammy Virk is all set to hit the screens by his upcoming biopic of Indian Hockey player Harjeet Singh Tuli. Harjeeta is based on the passionate true story of Harjeet Singh, who captained the Indian squad at the 2016 Men's Hockey Junior World Cup. Well, the entire details are revealed by Ammy Virk himself, who was present in a press conference held in PVR Plaza, Connaught Place, New Delhi. Along with him the producer of the film Bhushan K Chopra, Munish Sahni, Varinderr Kumar and Vikas Jain were also present for the same. 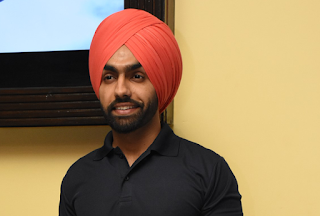 While talking to media peeps about the movie and his character Ammy Virk, stated, "Firstly, I would like to thank the entire media for supporting our film. Yes, Harjeeta is a biopic and it's releasing this 18th May. A film on Harjeet Singh Ji Captain of Indian Hockey Tema and his life journey. This movie revealing the struggle faced by him and his family and how his passion made his dream comes true." Further, he added, "My experience while working for this film was great. For a biopic, it's difficult to match the reel life look with real character, and somehow it worked well for us. Each and everyone from our team worked really hard for this film. It's a different film I hope people will; appreciate our work." As the movie is based on true story, it reveals the life of Harjeet Singh Tuli an Indian hockey player, whose family, like so many families in this country was struggling with the biggest problem of our nation, poverty. The passionate and much incredible story of India’s Winning Captain of HJWC 2016 Cup.